Learn how to Fly Today and Become a Pilot! The best thing about being a part of the aviation community is that you only need to have one thing in common with your fellow aviation enthusiasts; a passion for flight. You don�t need to fit a certain mold to become a pilot or enjoy flying. Aviation brings people together from all walks of life because anyone can fly. Even though it�s a small, rather tight-knit community, it isn�t difficult to be accepted into this faction of flight fanatics. Want to be a pilot? You�re in! Love airplanes? You�re in! Love to fly, or even the idea of flight? You�re in! What is a pilot certificate? An FAA-issued pilot certificate is, literally, your license to fly. It proves that you are authorized to exercise the piloting privileges for which you have been certified. The general structure of FAA pilot certification is student pilot, sport pilot, recreational pilot, private pilot, commercial pilot, and airline transport pilot (ATP). As a beginner, you will need to obtain a student pilot certificate, as this is the certificate that will allow you to learn to fly, and a medical certificate, depending on the type of certificate you are working toward. A student pilot certificate is not necessary to begin flight training, but you will need it to be able to fly solo. As a student pilot, you will train for one of the following: sport pilot, recreational pilot, or private pilot. The most common certificates issued are sport pilot and private pilot. A pilot certificate never expires, however every pilot is subject to a flight review with a certified flight instructor (CFI) every two years from the month in which they were certificated. The flight instructor will endorse your logbook to prove the review was successfully completed. What is a Student Pilot Certificate? One of the first steps toward earning your wings, is earning your student pilot certificate. Students working toward a private pilot certificate will need to undergo a routine medical examination administered by an FAA-designated doctor called an aviation medical examiner (AME). If the appropriate medical standards are met, the AME will issue you a student pilot certificate. Students working toward a sport pilot certificate can receive a student pilot certificate from a Standards District Office (FSDO) or FAA-designated pilot examiner simply by showing a valid U.S. driver�s license. A student pilot certificate is not necessary to begin flight training. The student pilot certificate is valid as long as the third-class medical certificate; until the last day of the month, two to five years from the month it was issued. For a private pilot certificate it is valid for two years if you are over 40 years old, and five years if you are under 40. For a sport pilot certificate, it is valid for five years. Once a student has accrued sufficient training and experience, a CFI can endorse the student's certificate to authorize limited solo flight in a specific type (make and model) of aircraft. A student pilot may not carry passengers, fly in furtherance of a business, or operate an aircraft outside of the various endorsements provided by the flight instructor. You MUST obtain a student pilot certificate before you are allowed to fly solo. The private pilot certificate is held by the majority of active pilots as it has the fewest limitations. It allows a pilot to fly any aircraft (subject to appropriate ratings) with passengers for any non-commercial purpose, day or night, and gives almost unlimited authority to fly under visual flight rules (VFR). The private pilot certificate is recognized internationally and allows a pilot to fly almost anywhere in the world with the proper authorization. Private pilots may also operate charity flights, subject to certain restrictions, and may participate in similar activities. With additional training, private pilots can be authorized to fly with more advanced capabilities. An instrument rating can be added to a private certificate which allows the pilot to fly in clouds or bad weather, referencing instruments only to fly. Pilots can also be authorized to fly aircraft with two or more engines, and/or fly professionally. As with all pilot certificates, a private pilot must do a flight review with a certified flight instructor (CFI) every two years from the month in which they were certificated to make sure no bad habits have emerged in one's flying skills. A flight review may consist of as little as one hour of ground school and one hour of flight time. The CFI will endorse your logbook to prove the review was successfully completed. Private pilots must also renew their medical certificate every two to five years depending on their age. What is a Sport Pilot Certificate? Thanks to efforts put forth by the EAA, in 2004 the FAA created the sport pilot/light-sport aircraft (SP/LSA) regulations. 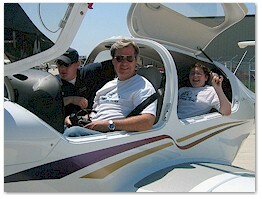 SP/LSA allows easier and lower-cost access for those who want to participate in the joys of flight. The sport pilot certificate can be earned in as little as 20 hours and allows you to fly only light-sport aircraft; one- or two-seat aircraft capable of speeds up to 138 mph. SP/LSA regulations gives authorization to fly during the daytime under limited visual flight rules (VFR), in the U.S. only. In most cases, you can pass the medical requirements simply by having a valid U.S. driver’s license. A sport pilot must do a flight review with a certified flight instructor (CFI) every two years from the month in which they were certificated to make sure no bad habits have emerged in one's flying skills. A flight review may consist of as little as one hour of ground school and one hour of flight time. The CFI will endorse your logbook to prove the review was successfully completed. Click here to learn more about sport pilot/light-sport aircraft. Click here to download the EAA Sport Pilot Sourcebook. How long it takes you to learn to fly is up to you. Most students need more training time than the required minimum to be prepared and comfortable enough to pass their final test, the checkride. Below is a brief overview of the minimum hours of flight time required for a private and sport pilot certificate and the minimum age for training and certification. Training hours include dual instruction (instructor and student), cross-country flying (departing one airport and landing at another), and solo flight. Note: This chart demonstrates the minimum hours of flight required and the minimum age at which you can start your flight training. Most student pilots require additional flight time to pass the checkride. As you can see, the sport pilot certificate requires half the amount of hours than a private pilot certificate. Therefore, a sport pilot certificate can be obtained in about half the time, and about half the price, of a private certificate. Since most can't put forth a full-time effort into their pilot training, it's realistic to assume a sport pilot certificate will take 1 to 2 months and a private certificate will take 3 to 4 months to obtain. Ideally, you should try to fly at least once a week to maintain a higher level of proficiency. If you are training for a sport pilot certificate and ever wish to upgrade to a private pilot, in most cases, your sport pilot training can be applied toward gaining a private certificate. Costs vary nationwide, so it is wise to do some research before you begin training. Talk to your local flight schools and/or local flight instructors to find a price and instructor that best fits your means and needs. The chart below gives an overview of the estimated overall cost to learn to fly for your private pilot and sport pilot certificate. The costs shown represent an estimated average for pilot training costs. The cost of your personal pilot training experience may be more or less than the rates shown below. * Prices may vary between flight schools/instructors, training materials, etc. Don't let the total amount discourage you. It's best not to think of it as a cost but rather as a life's investment. Remember that it's a once-in-a-lifetime chance, and once you learn to fly, you can fly forever. OK, I'm ready! What now? Why not consider becoming a member of the EAA (Experimental Aircraft Association)? Then find a local EAA Chapter near you. It's always a good idea to surround yourself with people who also love aviation and are willing to share their experiences with you. The EAA has provided useful Resources for Earning Your Wings, Flight Training Resources, General Aviation Organizations, Aviation Youth Programs and General Aviation News & Publications. Also consider becoming a member of the AOPA (Aircraft Owners and Pilots Association). The AOPA provides member services that range from representation at the federal, state, and local levels to legal services, advice, and other assistance. They are sponsoring the Flight Training Initiative, which is a long-term, industry-wide effort dedicated to increasing the percentage of students who earn a pilot certificate. Don't wait! Do it today! Earning My Wings A video blog about learning to fly. 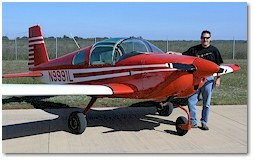 MyFlightBlog A blog about earning a private pilot certificate and experiences as a pilot. 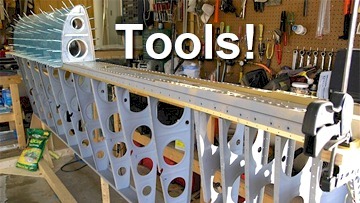 Airfreddy�s Learn to Fly Blog For people who don't know anything about flying and want to learn to fly. Start to Fly - UK Expert advice to help you learn to fly. EAA � Sport Pilot Sourcebook EAA�s guide to the sport pilot rule, how it affects you, maintenance, instruction, and much more. EAA � Reach for the Sky EAA�s guide to learning to fly and light-sport aircraft. ASA � You Can Fly! An introduction to the world of flying and flight instruction for prospective pilots. AOPA PATH Pilot and Teacher�s Handbook. Aviation Schools Online Your complete resource for locating, researching, and contacting schools in the aviation industry. Flight School List Largest aviation schools directory on the internet. ASA Aviation Supplies & Academics, Inc.
Thirty Thousand Feet An aviation directory with thousands of links to aviation web pages, news, and other sources of commercial, military, and general aviation information. USHPA U.S. Hang Gliding and Paragliding Association, Inc.
EAA Young Eagles A chance for young people, ages 8-17, to go flying in a general aviation aircraft free of charge. EAA Air Academy An exciting aviation summer camp for young people. Civil Air Patrol (CAP) If you�re dreaming of a career in aviation, space, or the military, CAP�s Cadet Program is for you. Aviation Explorers A youth development program centered around aviation careers. Youth Program Directory A web directory of Youth in Aviation websites. General Aviation News Provides up-to-the-minute, factual details about all aspects of general aviation. AvWeb World�s premier independent aviation news resource. EAA Radio A source of live, up-to-date information for those attending AirVenture; archives broadcasting year-round. Aviation Today Your first destination for global industry intelligence. AvBuyer The global aircraft market online. Plane & Pilot The magazine for active piston-engine pilots. Gliding Magazine The online magazine for glider pilots world-wide. Aero.com A listing of worldwide aviation magazines.